Using flavours such as Geranium, Sesame and Salt & Lime in their chocolate bars, the innovative ways of West Sussex chocolate geniuses, Montezumas, make it easy to let the mind wander down the Roald Dahl route…Willy Wonker, a certain Chocolate Factory, a river made of chocolate…or how about chocolate lager? 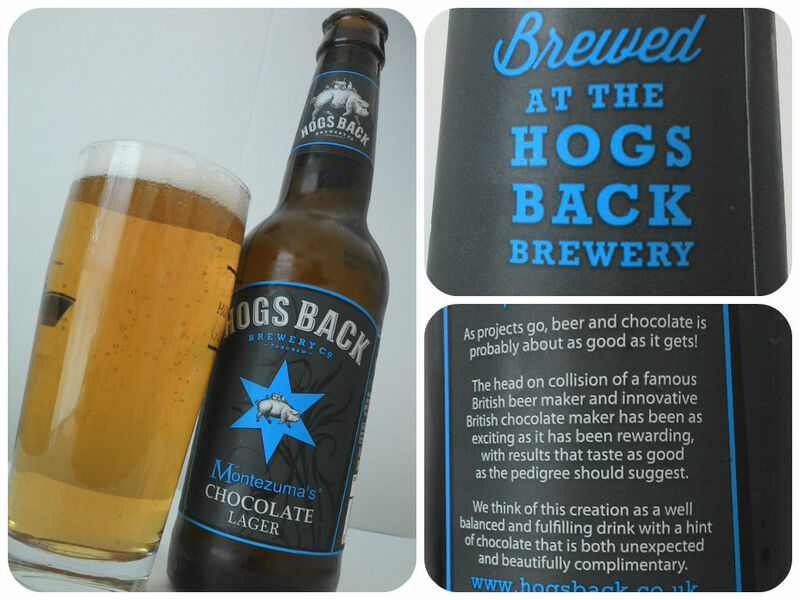 Their inventive approach has seen them team up with brewers Hogs Back of Tongham, in neighbouring Surrey. This is a collab that has produced a surprising little package. Initial thoughts of it being a black lager were wrong, to the eye this chocolate masterpiece is classic lager; crisp, clean, vibrant, fizzing gold- and it’s this classic lager base that makes this beer so much more than just the novelty some would pigeon-hole it as. The aroma is mouth-watering, tempting chocolate, with vanilla, summer fruits and familiar lager malts. On the palate is a quick, refreshing succession of sweet biscuit malt, chocolate then vanilla with welcome cherry fruit notes swinging in to cut through. A dry hop bitterness plays into the finish where the clean, classic lager notes show before ending with toasted hazelnut. The chocolate is very much there, both in the aroma and on the palate, and whilst it’s bold it never overpowers, never steals the limelight. Instead, the chocolate plays in perfect harmony with the other notes here- the vanilla, the cherry and summer fruits, the hazelnut. The mouth feel is full but clean and crisp, with the dry hop and hazelnut finish leaving you wanting more, almost cleansing the palate, ready for the next hit of the chocolate forward sequence. This original British craft beer is a quality lager, boosted by Montezuma’s chocolate, in a project that plays perfectly into the forward-thinking ways of both producers and is already appealing to non-beer drinkers. Let’s hope this sticks around and becomes the first in what could be a fantastic new range.